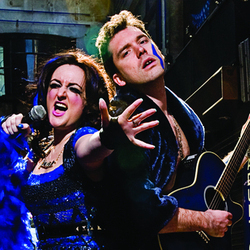 The characters are Pistol, a loud raucous, needy American chanteuse and Jack, undoubtedly English, but with a strange upbringing and a penchant for women and their story, interspersed with musical mash up is the substance of their 50 minutes. These two are unconventional in style. The night I attended they didn’t so much break the forth wall but demolished it as Jack attempted to come on to a lady in the second row and Pistol grabbing a guy to dance with her. I felt they really needed to concentrate on what direction they are going. Jack in particular is a fine musician and singer, Pistol a sassy woman who can sing too, but trying to tick too many boxes was confusing and left me thinking maybe specialising would be the way forward. The sound was not the best the night I attended also, the backing too loud and tended to drown the vocals, especially Pistols.